Sometimes the hardest part about shooting a TT-33 is finding decent ammo for it. Look no further than Sellier & Bellot loading of 7.62x25 Tokarev to feed your gun. This load fires a light 85 grain bullet at the extraordinary speed of 1,647 fps, producing the excellent penetration the cartridge is known for. 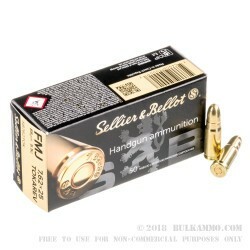 Unlike some Soviet surplus ammunition, Sellier & Bellot’s Czech-made ammo uses industry standard reloadable brass cases and Boxer primers. Each box holds 50 rounds. Sellier & Bellot is one of the oldest names in the firearms business. Founded in 1825 by Louis Sellier, S&B got its start manufacturing percussion caps for the Austrian Empire in vast quantities. The company has survived the downfall of its first major client, the establishment (and dis-establishment) of Czechoslovakia, and nationalization by Soviet-backed communist governments followed by privatization at the end of the Cold War. Through immense political upheaval, the company has managed to continually produce S&B branded ammo for almost 200 years. Shooters regard S&B ammo as every bit the equal of cartridges produced anywhere in the world—and the price advantage is just gravy! A: Hello Ben! 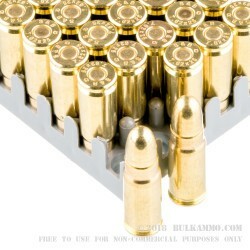 This Sellier and Bellot Tokarev ammunition is loaded with all new components. As a result, the components used do not contain any corrosive materials and you will have no concerns about that damaging your firearm. Q: Is this ammunition lead core/non-magnetic? A: Hello Brian, This ammunition does feature a lead core with a copper jacketed bullet. This ammunition does not contain any steel.